Personalized summer beach totes. Make style, versatility and comfort the essence of your summer wardrobe. 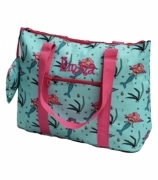 This fabulous leisure tote is fresh and fun with a mermaid theme. Summer white tote with a turquoise mermaid is the focal point. Use the tote to carry your towel, sunscreen, sarong, latest novel and sunglasses for a relaxing day at the beach. When the weather is cooler, it makes a great seaside shopping tote with two strong handles and a spacious main compartment. 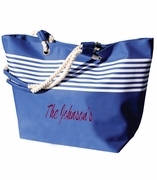 The two piece set includes a 7" x 4" accessory bag in the reverse colors of the beach bag. Useful for small items, keys, cell phone, make-up and credit cards.